After two and a half months of concerts across ten cities in the USA and Canada, the first leg of U2's Innocence + Experience Tour finished tonight in New York. Today's show is the first time U2 have ever played eight consecutive shows at any venue ever. It also equals the record for the most shows at the same venue on one leg of a tour. On Lovetown's first leg, U2 played eight shows in Sydney but they were done in separate clusters of three, two, and three between late September and mid November 1989. That leg contained the previous record for most consecutive shows: seven in Melbourne. The band have played 48 different songs at the 36 shows that comprised this leg. That equals their record of 48 different songs on the third leg of Vertigo - and in this case, 44 of the songs are original U2 numbers, beating 42 originals on said leg of Vertigo. The reason the count of different songs has reached 48 is because of a tour debut tonight. Party Girl was performed to celebrate the end of a successful leg. It was last played on 7 July 2009 (though in between then and now it was snippeted on 19 December 2010). That's an absence of 6 years and 24 days. Party Girl is by far U2's most enduring live b-side. It has now been played 188 times since debuting on 26 February 1983, appearing on every tour from War to Innocence + Experience with the sole exception of Popmart. The show's other big surprises came in the encore. Every night of U2's stand in New York there have been rumours of a guest appearance by Bruce Springsteen and those finally came true. He joined U2 for I Still Haven't Found, which segued into a full performance of Stand By Me (which was not on the printed setlist). 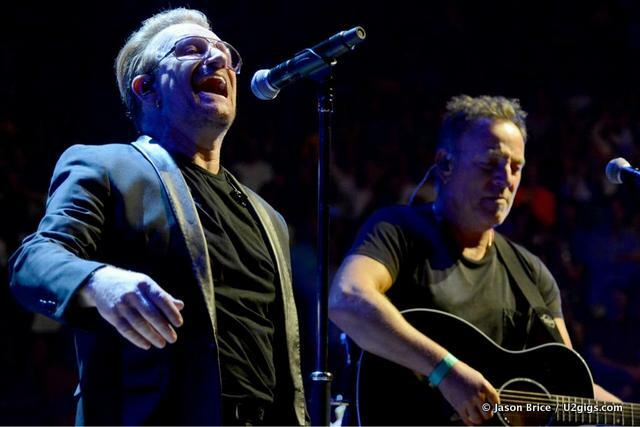 Bono acknowledged Springsteen as an inspiration to U2, setting a level to which they always aspired, and then gushed to the crowd about this being the best show on the band's best tour ever. The encore ended with a special treat, 40, back after missing seven shows. A couple of other songs earlier in the night had also returned after briefer absences. The second song of the night was Out Of Control, back after missing four shows. Before Party Girl, Desire was performed after missing one show. It was dedicated to Engine 44, who responded to the emergency call when Bono had his bicycle accident last November. U2 now take a short break before touring Europe for the first time since 2010. Opening night is 4 September in Turin, though we believe there will be some rehearsals beforehand. We will of course keep you updated, and on the European leg we expect to have videos courtesy of our talented webmaster Matt. We look forward to your company then, and thanks to everybody who has read, commented, and interacted with us over the first leg of this tour. Your support is always appreciated. If you attended shows, why not create your personal concert statistics?